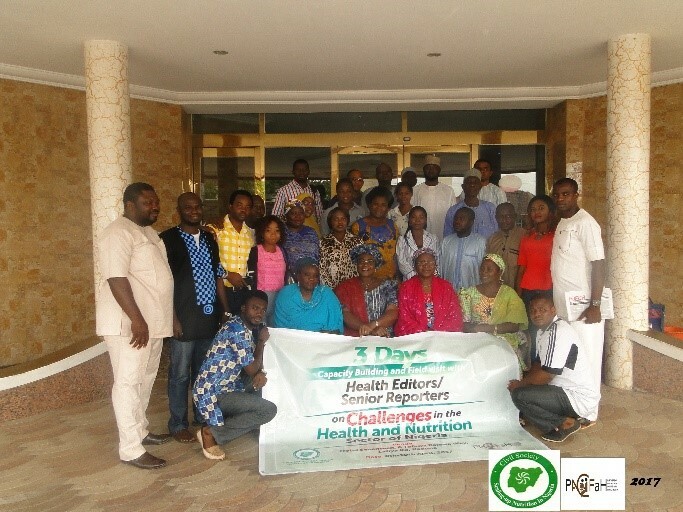 To equip selected Health Editors/Senior reporters with relevant health and nutrition information that will promote effective reporting of health and nutrition issues, especially funding gaps. To engender passion and commitment to reporting health and nutrition issues through site visits for first-hand experience of the malnutrition situation in the state. To disseminate the 2016/2017 health and nutrition budget outcomes to Health editors/reporters for use in stories and articles. To empower the media with relevant information to push for increased and timely release of funds allocated to health and nutrition in the 2017 budget. To get the media to commit more airtime/space for to Child and Family Health in Nigeria and focal states. CS-SUNN Project Director, Mrs. Beatrice Eluaka presided the programme with support from staff, Media, State Nutrition Officers from three focal states Niger (Mrs. Amina Isah), Kaduna (Mrs. Jane Gwani) and Nasarawa (Mrs. Amina Ahmed) and Mr. Lawal Jibrin , SMOH, Zaria. Project Director CS-SUNN/PACFaH project Mrs Eluaka in her presentation “Nutrition Situation in Nigeria and Challenges” lamented that with the Nigeria demographic and health survey (NDHS) 2013 reporting the prevalence of stunting 37%, underweight 29%, and wasting 18% in children under five years old, affected Nigerian children will suffer poor physical growth and brain development, preventing them from thriving and living up to their full potentials. She also identified the challenges of Malnutrition as Ownership, poor funding, Low Scale of Coverage, Political commitment to health development, inequity in the distribution of health facilities and health personnel amongst others. CS-SUNN’s Communication Officer, Lilian Ajah-mong who presented a paper on Media and Effective Coverage of Health and Nutrition Issues in Nigeria, identified five key tools the media should uphold in effectively reporting health and nutrition issues; Newsworthiness, Data, Vox-Pop, Packaging Stories to make headlines and ensuring that follow-up and in-depth reports are done alongside baseline stories. Presenting a paper on Budgeting for Health and Nutrition in Nigeria: Trend Analysis, CS-SUNN’s Program Manager, Mr. Sunday Okoronkwo disclosed that over the past 7 years the Federal government’s health spending has fluctuated with percentages ranging from 3.58% in 2010 to 5.95% in 2012. He noted that the challenges in the Health and nutrition sector in Nigeria cannot be overemphasized and called for adequate funding to save the lives of women and children who die daily from preventable diseases. CS-SUNN’s Project Officer Mr. Nnaemeka Ubah reviewed the supervisory checklists and in collaboration with the Kaduna State’s Ministry of Health, Mr. Lawal JibriIn led field visits to Tudun Wada Primary Health Care Facility, an OPT centre (CMAM Site) at Makama Abbas Primary Health Centre and an IYCF centre in Angwan Fatika, Zaria which gave participants a first- hand experience of malnutrition cases and challenges. That States needed to do more in order to surpass the 15% Abuja declaration which is germane to addressing the ever increasing health burden in the states. High rate of acute malnutrition at OTP sites visited. Lack of sufficient Power supply which poses the challenge of maintaining frontline services, life-saving operations, storage of vaccines and blood work, powering of equipment amongst others. Poor Sanitary conditions in health Facilities (e.g. poor toilet conditions, waste disposal and lack of good water supply) which prevents promotion of good hygiene practices and could promote the prevalence of diseases such as diarrhoea. That Government, Media and CS-SUNN/PACFaH sustain sensitization and enlightenment campaigns to address ignorance in malnutrition and IYCF. That CMAM/OTP sites be scaled-up to at least 10 LGAs by the end of 2017. That CS-SUNN/PACFaH meets Media Chief Executives to advocate for more airtime/space for Health and nutrition issues in their various media organisations. That Government should ensure increased allocation to and timely release of funds to the Health and nutrition sector. That Government should fulfil its commitment made at the Abuja declaration of 2011 to commit 15% of the total budget to the health sector. That the media through their reportage and programmes, push for accountability from the government on health and nutrition budgeting. That the Government, CS-SUNN/PACFaH and relevant stakeholders endeavour to make data available for the media. Media practitioners described the training as apt and timely saying it gave them a first-hand experience of the malnutrition situation, exposed them to the nitty-gritty of nutrition and has equipped them with requisite capacity and knowledge needed to bring health and nutrition to the front burners of public discourse. They also came up with a strategic action plan and made various commitments (airtime for interviews, talk shows, health programmes, special reports, documentaries and space for columns, interviews, exclusives amongst others) to put health and nutrition issues in the spotlight on their various media.